by Hartmann Schedel. Nuremberg: Anton Koberger for Sebald Schreyer and Sebastian Kammermeister, 12 July 1493. 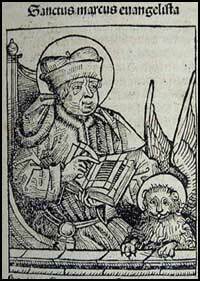 Hartmann Schedel (1440-1514), the author of the Liber Chronicarum, was by profession a physician who resided in Nuremburg, Germany. Schedel receive his medical degree in 1466 and moved to Nuremburg in the early 1480s, At the time Nuremburg was a prosperous medieval center of book production with a population of between 45,000 and 50,000 inhabitants. This prosperity was partly due to the great town wall and moat built in 1450 to protect the city from war and vandals. Aside from working as a physician, Schedel was also known as a humanist and bibliophile. Through his interests, he began a personal collection of medieval manuscripts that he later laboriously handcopied throughout his life. (made transcriptions?) In 1470 he started to purchase printed books. Many of these books subsequently became the sources for the Liber Chronicarum. Two important men of Nuremberg commissioned Liber Chronicarum from Schedel, Sebald Schreyer (1446-1520), an assessor who had considerable holdings in real estate and mining and Sebastian Kammermeister (d.1501), Schreyer’s brother-in-law. Liber Chronicarum is the history of the world in 600 pages from the Creation up to 1493. In the book, Schedel follows accepted practice for historians of time, providing a standard use of Biblical chronology. Before the Renaissance European history was predicated on a “Divine Order of Time” which included not only the Creation but all time until Judgment Day. Even within the context of these medieval constraints, Schedel isn’t considered a good historian. In addition to not citing his sources, he appears to draw on accounts that accentuate Italian history. His research has been called “sloppy”. One scholar points out that he has included two different descriptions of Sicily and three of Brittany. Schreyer and Kammermeister, the patrons of the edition, signed a contract in 1487/88 with Wolgemut and Wilhelm Pleydenwurff for the woodcuts in the book. Both were well known Nuremberg painters and woodcutters and Albrecht Durer apprenticed in their shop. 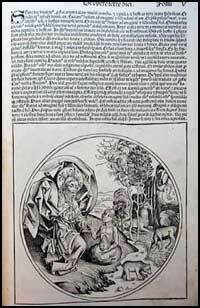 The Liber Chronicarum is known for its 1809 woodcuts from 645 blocks and is the most highly illustrated incunable. Many of the images are on Biblical topics. The book also includes 32 accurate illustrations of European towns (such as Basel, Budapest, Florence, Cologne, Munich, Nuremberg, Prague, Rome, Salzburg and Vienna); the rest of the town views and the majority of the hundreds of portraits are imaginative—and often use the same portrait for a saint, king and town father. The first printed map of Germany in a book is found in the Liber Chronicarum. At least five woodcuts are ascribed to apprentice Durer who finished his three year apprenticeship in December 1489. It wasn’t until March 1492 that the contract with Anton Koberger was signed. With the largest publishing, printing and bookselling concern in Europe, Koberger was the obvious choice as printer and distributor of the book. Koberger’s first book was published in 1471. That same year he became godfather to Albrecht Durer. 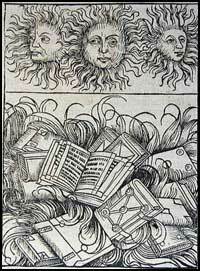 From 1480 on Koberger was considered the most important publisher in Germany until his death in 1513. During his long career he printed over 250 titles. As a sidenote, Koberger had 23 children by 2 wives—the last born a year before his death at the age of 73. Only 13 out lived him. Amazingly all the original contracts between the publishers, illustrators and printer are still extant. The book was to be issued in two large editions, in Latin and in German. Unfortunately the number of copies to be printed was not included in the contract. Historians guess there were 1500 copies of the Latin version and 1000 of the German. Again, incredibly, exemplars of the printer’s paste-ups with handwritten notes, drawings of woodcuts and the basic layout, for both editions still exist. We do know that for every ream of 4-page printed sections, Koberger received 4 guilders. Anton Koberger printed the Liber Chronicarum in a fine rotunda typeface in his shop that had 24 presses. 400,000 sheets of paper were used in the book, probably from five or six different mills. Surprisingly even though the Nuremberg papermill is represented as an image in the Nuremberg town scene, none of its paper was used in the edition. It appears that Koberger didn’t think highly of the paper produced there. In the contract Koberger promised to keep the book in a locked room to prevent plagiarism or theft. The Latin edition was finished on July 12, 1493 and the German on December 23, 1493. The original shipping records prove the book was widely distributed throughout Europe. The price for the book upon publication was two Rhenish gulden for the unbound printed sheets. In the 15 th century, clients would then have their books bound to their specification by a separate binder. It cost six gulden for hand colored and bound copies. Unfortunately the edition wasn’t a success and after 16 years 571 copies were still unsold. Book historians speculate that the reason for this lack of interest in the book was the competition from the much smaller, cheaper pirated edition that was printed by Hans Schonsperger in Augsburg in 1496/97 and 1500. The extant copies of Liber Chronicarum are widely distributed and it is the most “common” of the incunables. At least 800 Latin and 400 German copies exist. For more information on this fascinating book see: The Making of the Nuremberg Chronicle by Adrian Wilson.